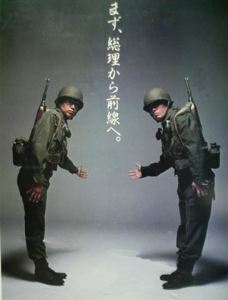 It says: “After you, Prime Minister.” (lit: “The Prime Minister shall step up to the front-lines first.”) The ad was designed by famous art director Katsumi Asaba too. It’s really strange and interesting how many things Itoi has been involved with and how his works continue to live on over the years. For more details on Itoi and his past works that don’t necessarily involve MOTHER, see Chewy’s excellent article here! Who protects Japan if they don’t have an army? And the U.S. military has a big presence there too, of course. I can understand them wanting a force, but we protect them well. Wow, stick it to the man Itoi! The SDF is pretty well funded btw. It’s not some dinky force like some would lead you to believe. Damn, Itoi makes big balls phone calls calling out the PM. Shots officially fired!